I like to embroider as much as I like to quilt. I've often thought of incorporating some of my hand-embroidery into a quilt, but since I've never seen it done here I'm wondering if anyone else does it, or if it is just too tricky. Not tricky at all, I have made Winter Wonderland and Snowladies which have piecing and hand embroidery. I am currently working on another one. ​There are some lovely embroidered quilts on QB. Use the search box for the Winter Wonderland and Snowladies and several should come up. I have lots of quilts on QB using embroidery and some cross stitch. Embroidered blocks in quilts were very popular in the 1940's, too. Unfinished tops and blocks are still available (for sale) from that time frame. They're just not what's popular now. Here's one I did, called Aunt Bea's Parlor. Hand embroidery, 1930's repro prints, and big stitch quilting with floss. It works great to use embroidery and quilting. I have made several. When I have made them I always go for 30's fabrics. 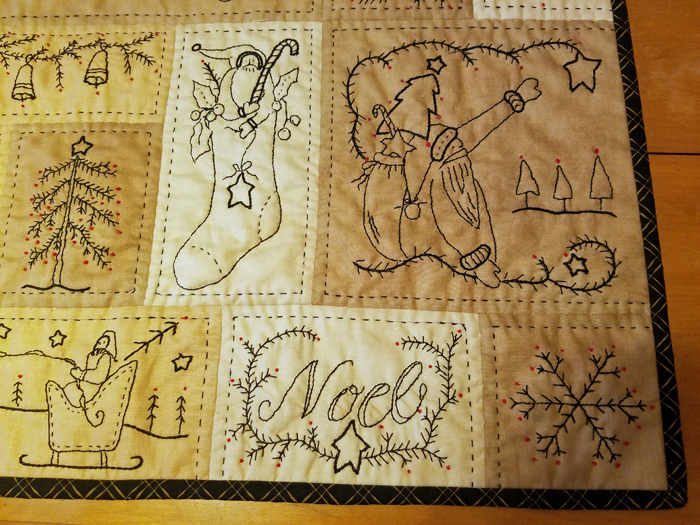 I set the embroidery blocks into the quilt like a standard quilt block, then freemotion stitch around the embroidery to match the background fabric. It really works great and helps the embroidery stand out. 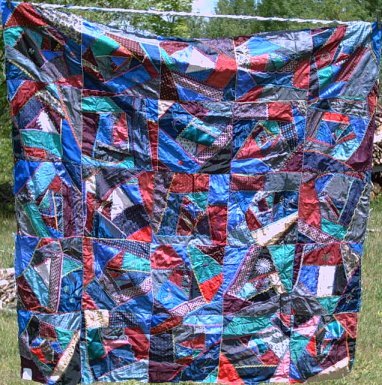 Sewbizgirl, your quilt is beautiful. I could never do the hand embroidery, but I am going to keep that layout in mind when I see some machine embroidery I like. Sewbizgirl-love your quilt and repo's 30's fabric is my favorite fabrics. Your quilt is beautiful. Jazz-what about looking for old pillow cases or some other articles that have embroidery on them. I have been collecting items that have embroidery on them and cut out the thread work and I am going to make a crazy quilt with the embroidery in the center. I think your hand work would be beautiful in a quilt. Beautiful quilt.... hand embroidery and piecing so gorgeous together. 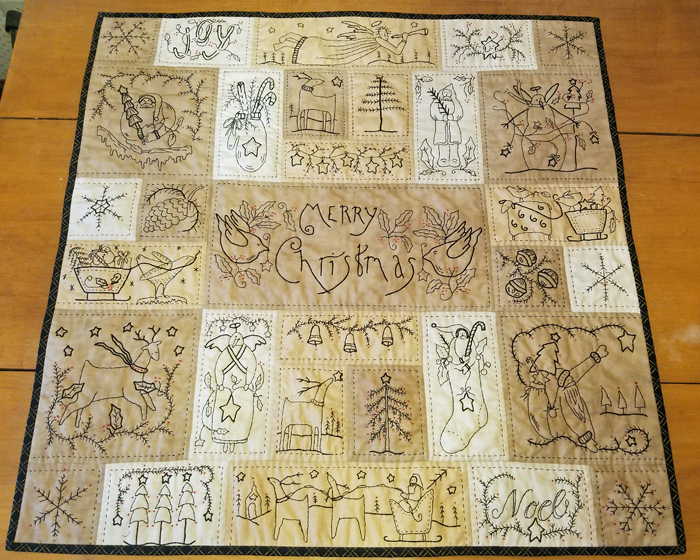 About 5 years ago I made a somewhat "crazy" quilt with sew and flip using embroidery from pillowcases, etc. It was fun to do. Embroidered quilts are a category at our fair, so they are not rare. Sewbizgirl, I have that pattern and seeing it got me started thinking about it! Moving it to top of my list!!! I have made embroidered quilts from kits, and also made a couple of silk crazy quilts with embroidery. The crazy quilts were fun, I did 12" blocks and did not repeat an embroidery stitch more than once in each block. I haven't done it, but I would think you could make the embroidery squares and treat them like panels. A good source for vintage hand embroidered blocks is eBay. 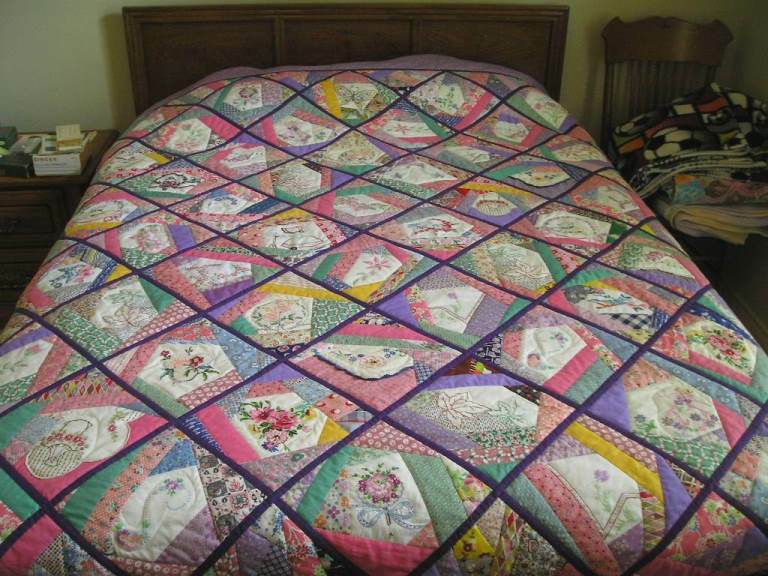 I have done 1/2 dozen quilts using vintage embroidered blocks. If only I knew how to post pictures of them, I would. Sewbizgirl, your quilt is gorgeous! I incorporate embroidery a lot in my quilting. 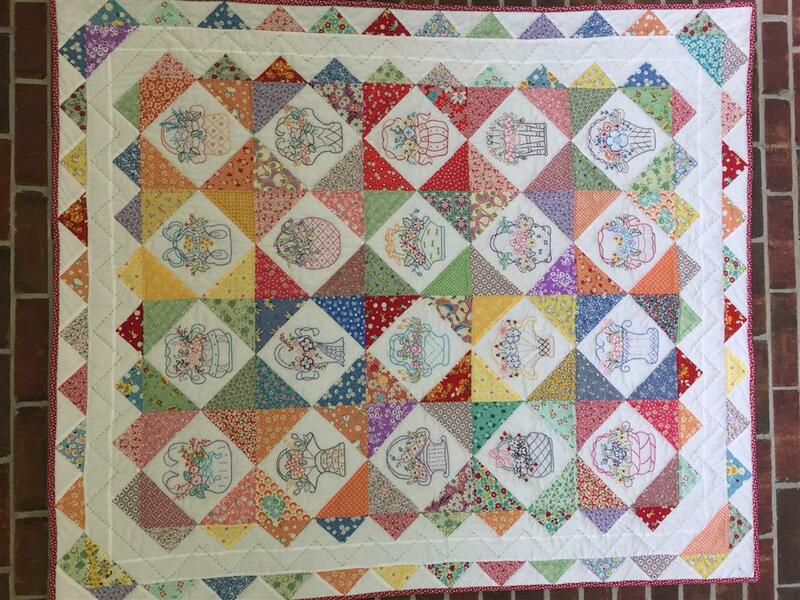 Just incorporate embroidery blocks with traditional quilt blocks in a quilt. A good way to start. Crab-Apple Hill has a whole series of quilts on which embroidery plays a large part. 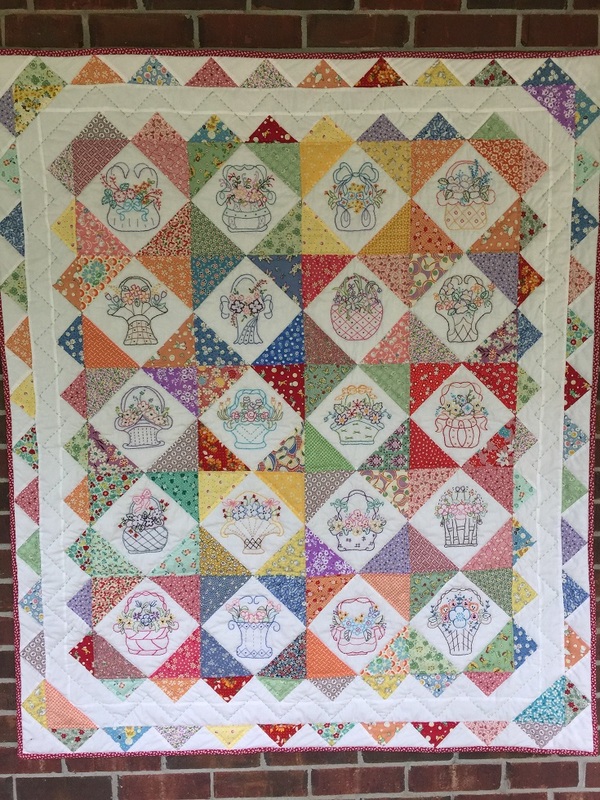 Crabapple Hill and Bird Brain Designs both have embroidery patterns for quilts. Annie's has a lot of quilt blocks to embroider for quilts also. 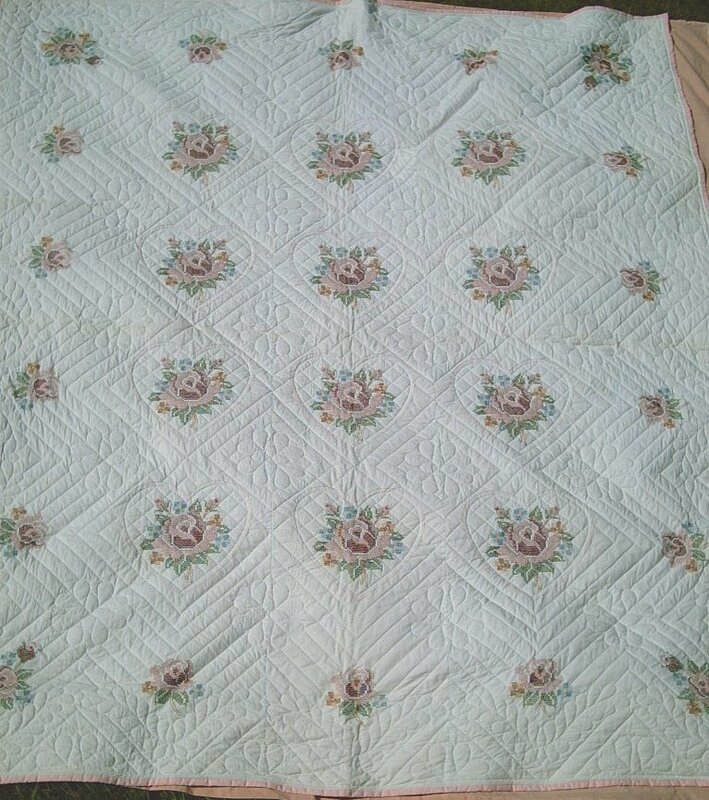 Little Brown Bird quilt incorporates hand embroidery in the vining. I'm the worlds worst at embroidery, so the quilts I've done that called for it, I've done pen work.